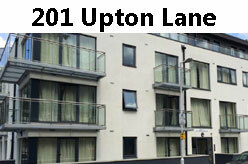 201 Upton Lane Apartment rental in London. Serviced apartment in London for rent. Located approx. 4.3 km from Westfield Stratford City and Queen Elizabeth Olympic Park. 201 Upton Lane offers free WiFi access, separate lounge area with flat-screen TV, a private bathroom and a fully equipped kitchen with all necessary cooking facilities. Total 13 rooms. Room types are 1 Bedroom Apartment, 2 Bedroom Apartment, Penthouse Apartment and 3 Bedroom Apartment. London, Greater London, E7 9PR, UK.